The Nokia X, Nokia X+ and Nokia XL are Nokia's first Android smartphones, representing a significant departure for this Microsoft-owned company.. but if you are expecting a vanilla Android experience, then these are definitely not the 'droids you are looking for. Perhaps borrowing some inspiration from the Amazon Kindle Fire range, these Nokias use a heavily customised version of Android (also called Nokia X), designed to download apps from Nokia's own store rather than Google's (although third party app stores can also be used). 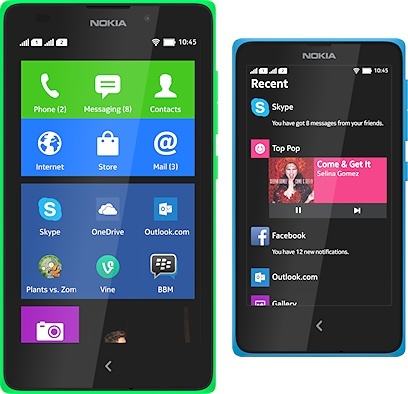 The user interface has also been substantially reworked with an application called "Fastlane" that offers an environment rather more like that on the Windows' based Nokia Lumia series. This trio of X-Series phones are all quite inexpensive and are closely related. The cheapest device is the Nokia X which is due to hit markets straight away at an estimated price of €89 before tax and subsidy. The X is a dual-SIM device with a 4" 480 x 800 pixel IPS display, 512MB of RAM with 4GB on onboard storage and a microSD slot, a 1GHz dual-core processor with a basic 3 megapixel camera on the back. Inside is a 1500 mAh battery, and the unit weighs 129 grams. The X is a 3.5G capable device with WiFi, Bluetooth and GPS and it is housed in an attractive Asha-style plastic case. A slight upgrade to the X is is the Nokia X+ which has all the same features as the X but with more internal RAM at 768MB and it comes with a 4GB microSD card in the box. The X+ comes in at €99 before tax and subsidy and will be available from Q2 2014. 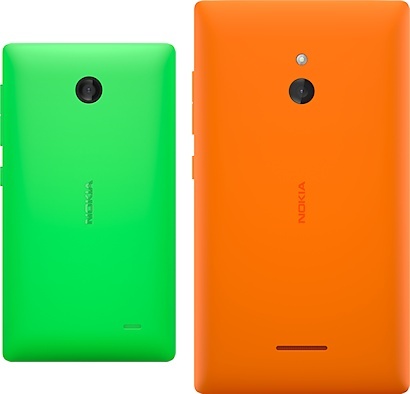 The Nokia XL takes the same basic concept but stretches the display to a 5" 480 x 800 pixel panel. On the back is a 5 megapixel camera with autofocus and flash plus a 2 megapixel one on the front for video calling. The battery has been boosted to a larger 2000 mAh cell, and the rest of the internal specifications are the same as the X+ (except there's no microSD card in the standard sales package), and of course it is a fair bit bigger and heavier at 190 grams. The XL is slated to be available from Q2 2014 at a price of €109. Software enhancements include access to Microsoft's OneDrive (formerly SkyDrive), Skype, BBM and Nokia's HERE Maps and MixRadio services. Although you can't expect the Nokia store to have quite the same enormous range of applications as Google's, Nokia say that the applications will be quality-tested which is something that Google don't offer. These Nokia devices are heading to most markets outside of North America, rather than being restricted to developing markets alone.. so yes, you should be able to get hold of one of these if you live in Europe. Within Nokia's own range, these X devices compete head-on with some of the cheaper Lumia phones and may well dent sales. But they are much more sophisticated than Nokia's Asha range of feature phones and they do offer a choice that many Nokia fans have been crying out for.